Founded: 13th century. Current style: baroque. 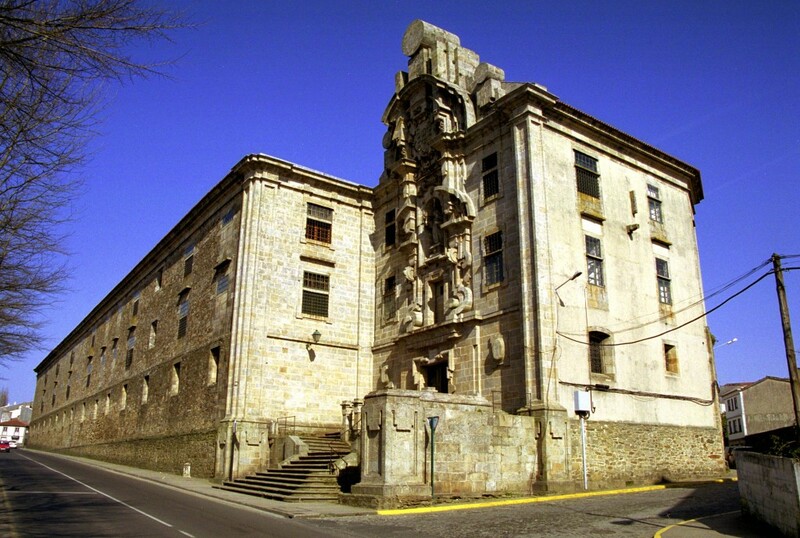 The construction of the present-day convent dates from the baroque period (late 17th century). The main façade, designed by the Compostela architect Simón Rodríguez (18th century), is one of the best examples of the theatrical sense of Spain’s baroque style: it is a curtain-façade that hides the cloister and, at the back of a small interior garden, the church, which is also baroque but simpler. This curtain-façade reflects the characteristic Compostela style called “barroco de placas,” which refers to the pure geometric shapes that seem to be superimposed on the walls: a style imposed by the hardness of granite, which obliged the sculpting of emphatic shapes. The Convent of Santa Clara was declared a National Monument in 1940. Inside, all that remains of the original medieval construction is the granite pulpit and the founders’ coats of arms. The main altar is baroque from the 18th century and is dedicated to the Immaculate, who is highly venerated by the nuns of the Order of St. Claire and the Franciscans, and to the founding saints. The altarpieces in the transept are dedicated to the Virgin and St. Anthony of Padua. There are also several Churriguera-style altars (an overelaborate ornamentation style used in Spanish architecture during the 18th century) in the nave, dedicated to Franciscan saints. As in all enclosed convents, the most outstanding feature is the grating covering the two choirs (the upper and lower ones), where the nuns of the Order of St. Claire attend the liturgical offices. According to tradition, if you do not want it to rain on your wedding day, you should take a basket of eggs to a convent belonging to the Order of St. Claire. This tradition is still alive in Santiago. There are currently 13 nuns living in the convent. Apart from prayer and other convent chores, they do work for individuals and the city’s churches: ironing, starching and gold embroidery (even football team pennants! ).